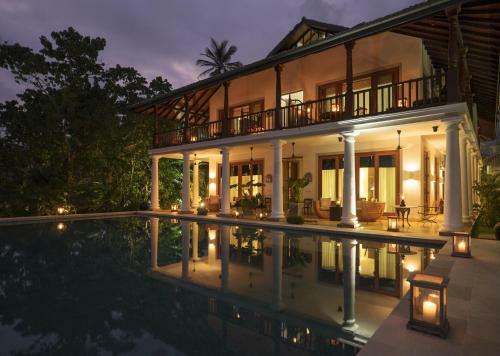 Located in Weligama, Eraeliya Villas & Gardens offers a private beach area and is a 30-minute drive from the historic city of Galle. This self-catering accommodation features free Wi-Fi and a garden with tropical trees. Accommodation will provide you with a flat-screen TV air conditioning and a balcony. Complete with a refrigerator, the dining area also has a dining table. Featuring a bath or shower, private bathrooms also come with towels. You can enjoy a garden view. Extras include a terrace, a seating area and a dvd player. Some of the properties have sofa and a private pool. Guests can go surfing, fishing and sailing. Relaxing activities include the spa, beach yoga and massages, Cooking classes are also available. The property can organize excursions to several of Sri Lanka's stunning natural and cultural attractions. Mattala Rajapaksa International Airport is located 86 km away. Vila ve srílanském stylu se 2 ložnicemi, luxusním posezením, kuchyní a velkou terasou s výhledem na moře.